International Convention Centre Sydney (ICC Sydney) is showcasing how Sydney’s leaders, entrepreneurs, research hubs, businesses, and its premier new convention, exhibition and entertainment precinct, are all strengthening Sydney’s reputation as an innovation capital in a special issue of Sydney Views magazine, launched today. Themed around Technology and Innovation, the third edition of the industry-first publication features a raft of talented contributors from across industries, including Sven Bossu, Head of the world’s premier financial services event, Sibos, who reveals why Sydney is now a top destination for major technology events. Other articles reveal the game-changing research being undertaken at the University of New South Wales, local and Government initiatives that are fostering Sydney’s startup culture, new infrastructure reinvigorating the city, as well as the unique digital foundation that makes ICC Sydney one of Asia-Pacific’s most technologically advanced venues. Sydney Views also features commentary from the likes of Mike Baird, Premier of NSW, Stuart Ayres, Minister for Trade, Tourism and Major Events, and Sandra Chipchase, CEO of Destination NSW, on what it takes to construct a world leading capital, and guides readers to the best tech and cultural events happening this spring/summer. 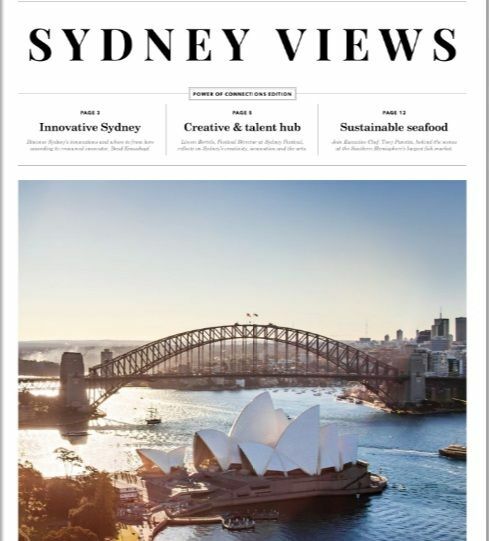 Launched by ICC Sydney on 18 October at IMEX America: The Worldwide Meetings and Incentive Travel Exhibition, Sydney Views – Technology and Innovation will be available in both print and online. Copies will be distributed directly to ICC Sydney’s extensive national and international client base, at key industry events, in local Sydney cafes and hotels, and via partners such as Business Events Sydney, Destination NSW and Tourism Australia. Visit the ICC Sydney website to read the issue online.